Chef Parul Desai began writing professionally in 2011. She maintains a healthy cooking blog and has taught cooking classes, worked in restaurants, created educational materials and written recipes. Desai received her Bachelor of Science in dietetics from Virginia Tech and completed her internship with ARAMARK. Later, she went to the Institute of Culinary Education to become a certified chef. Recipes for sauces, soups, desserts, ice cream and cheesy sauces such as Alfredo sauce often call for heavy cream, which is high in calories and contains unhealthy saturated fat. If you are trying to lose weight or transitioning to a heart-healthy diet, you should ingest 22 grams of saturated fat or less if you consume 2,000 calories daily. Replacing heavy cream with a healthier food is a good way to cut excess calories and saturated fat. Each 1 tbsp. of heavy cream contains 50 calories and 5 g of fat, including 3.5 g of saturated fat, which can raise your blood level of cholesterol, a waxy substance that travels in your blood. High blood cholesterol can ultimately raise your risk of atherosclerosis and coronary artery disease. Heavy cream has no other significant nutrients, making it a calorie-dense, nutrient-poor food source. Even if you splurge and put 1 tbsp. in your coffee, there may be hidden heavy cream in other parts of your diet. A rich cream sauce on your fish, the Alfredo in which your pasta swims, your clam chowder appetizer and the whipped topping on your dessert may each contain more than 1 tbsp. of heavy cream. Those unnecessary calories and fat grams can add up quickly if you’re not paying attention. Coffee shops offer a variety of milk products for your coffee or tea. Switching to 1/4 cup of reduced-fat milk cuts calories to 30 per serving and reduces fat to less than 1 g. If you're preparing your coffee at home, you could substitute fat-free half and half for full-fat, heavy cream, because it has only 20 calories in 2 tbsp. and contains no fat. An average serving of many desserts such as ice cream contains about 1/2 cup of full-fat dairy ingredients, including heavy cream. If you want to create your own desserts, such as custards, ice cream or panna cotta, and keep a rich consistency, fat-free half and half, soy milk or almond milk are possible options. One-half cup of heavy cream has 400 calories and 40 g of fat, while 1/2 cup of fat-free half and half has only 80 calories and no fat. 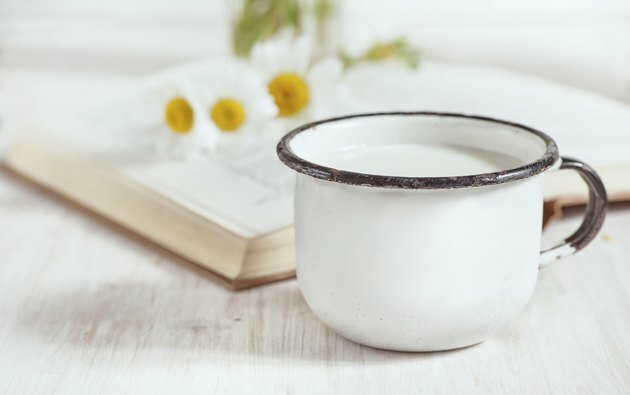 A 1/2-cup serving of soy milk is another light alternative, with only 40 calories and 2 g of fat, as is almond milk, with 20 calories and 1.5 g of fat in 1/2 cup. Some desserts just don’t feel complete without whipped topping. However, full-fat whipped topping can have 100 calories and 10 g of fat in a 2 tbsp. dollop. Instead, try a low-fat alternative, sold under various brand names, often with only 20 calories and 1 g of fat, or a fat-free topping, which can have as little as 5 calories in 2 tbsp. Fat-free half and half can work well in creamy sauces or soups, adding smoothness and flavor without saturated fat. When mixed in vegetable purees, fat-free evaporated milk lends creaminess without fat and excess calories. A 1/2-cup serving of fat-free evaporated milk has only 100 calories, but provides 35 percent of your daily recommended intake of calcium. You can also replicate a smooth and creamy texture by pureeing vegetables such as cooked cauliflower to replace cream completely. Meat stocks have few calories and add a rich thickness to sauces when reduces, adding few if any fat calories. For example, 1 cup of chicken stock has 25 calories and can be either low-fat or fat-free, depending on the product. Combining stocks with wines also makes flavorful sauces without adding extra fat.